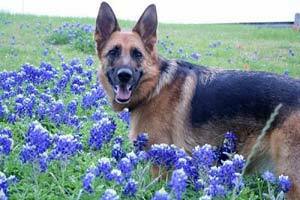 Female German Shepherd dogs are known for loyalty and protectiveness. They play many roles from companion to guard dog. They also make outstanding service animals, often used to help those who are visually impaired. Female German Shepherds deserve a name with strong character, but matching the personalities of your GSD dog. There are so many GSD puppy names to choose from, it is hard to find your perfect dog name. It worth the time to pick a suitable name for such as intelligent, courageous and capable breed of dogs. We hope you will find your satisfied German Shepherd dog name from this list of 68 cool dog names. Adele: German for noble and kind. Alexis: Defender. The name is perfect for a guarding GSD dog. Allegra: Italian for lively or cheeful. Anna: Hebrew for God has favored me. Athena: The virgin goddess of wisdom and war in mythology. Aurora: In mythology, Aurora was the Roman goddess of sunrise. Autumn: The fall season, season of harvest. Avalon: Island of apples. In Celtic mythology, Avalon is an island paradise. Barbie: Barbie is a fashion doll manufactured by the American toy-company Mattel, Inc.
Bild: The Bild Lilli Doll was a German fashion doll. She is the predecessor of Barbie. Brunhilda: One of the Valkyrie, maidens who ride into battle. The name has connotations of great physical strength. Bulah: A biblical name symbolic of the heavenly Zion. Cadence: With rhythm, modern name based on the musical term. Cadence Roth is the main character in the novel "Maybe the Moon". Chelsea: The glamorous district in London and several places in America. First Daughter Chelsea Clinton was named after the Joni Mitchell song "Chelsea Morning". Cheyenne: Name of a Native American tribe. The Cheyennes were famous for their courage in battle, and the capital city of Wyoming is named after the tribe. Daisy: Day's eye, also a flower name. Henry James named the typical American girl in Europe as Daisy Miller in his story. Dante: Lasting, enduring. Dante Alighieri was considered one of the great poets of all time. Destiny: The Greek deity of fate in mythology. Dulcia: Sweet. Also fourth letter of Greek alphabet. Elsa: Name of the lioness in the book "Born Free" by Joy Adamson. Emma: Greek for Torch or Bright Light. Title character of the Jane Austen romance novel "Emma". Fancy: Imagination, fantasy, an unusual idea. The name may refer to a dainty baby girl. Frankie: Made famous by the name of the heroine of "The Ballad of Frankie and Johnny". Frida: Elf, magical being strength. Gisela: Name of a famous 19th-century ballet whose heroine is a peasant girl. Gretchen: German variant of Margaret, which means "pearl". Gretel: Heroine character in German fairy tale Hansel and Gretel. Hanna: Hebrew for Grace. Variant of Hannah, who was the mother of the prophet Samuel in the bible. Heidi: Exalted nature. The name of a girl of the Swiss Alps in the children's novel "Heidi". Henrika: German for home leader. Ida: A Greek nymph who cared for the infant Zeus on Mount Ida in mythology. Katrina: Variant short form of Katherine, which means "pure". Klara: Hungarian Variant of Clara, which means "famous, brilliant". Lucy: Latin for Light. Also a bossy little girl in Charles Schulz's popular "Peanuts" comic strip. Luster: German for Cheerful or Care Free. Matilde: German for Powerful Fighter. Melle: A city in the district of Osnabruck, Lower Saxony, Germany. Melody: Music, song. Your puppy named Melody will bring a song to your heart. Milda: A small German City. Also the Lithuanian goddess of freedom and love. Millie: German for Strength and Determination. Molly: Star of the sea, pet form of Mary. Nala: African for Successful. Also a female lion character from Disney's The Lion King. Nixie: German for Water Sprite, usually beautiful. Nora: The heroine of Ibsen's "A Doll's House". Ricarda: Powerful leader, also feminine form of Richard. Rika: German for Powerful Protector. Rio: Spanish for Big River. Sandy: Greek for Defending Men. Perfect for a light reddish-brown hair puppy. Tilly: German for Mighty in Battle. Trudi: German for Strong Spear. Victoria: A goddess who smiled on the ancient Roman people for many centuries. Willa: German for Will, Desire, Helmet, Protection. Wilma: German for Determined Protector. Wilma Flintstone is the dizzy Stone Age housewife in the TV cartoon "The Flintstones". Zelda: German for Dark Battle. Zephyr: Greek for West Wind.